The Frame: The outer frame is constructed from 1/8” thick masonite, with box joints connecting the separate pieces. As shown in the drawing below, the frame is 17.7” wide, 17.5” deep, and 21.13” tall. 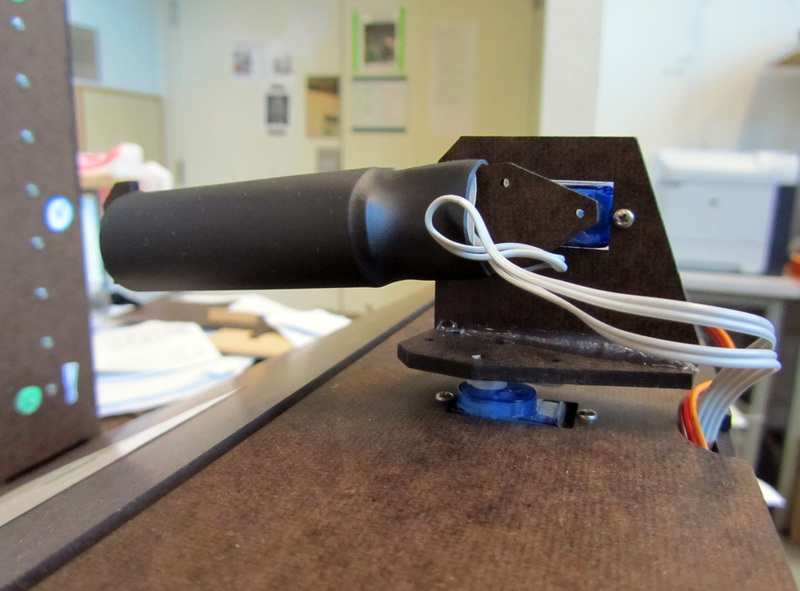 Laser Gun: The laser gun, mounted 9.25” above the base of the frame, consisted of two Micro HXT500 Servos in series. These two degrees of freedom allow the user to aim anywhere on the plane of the board. 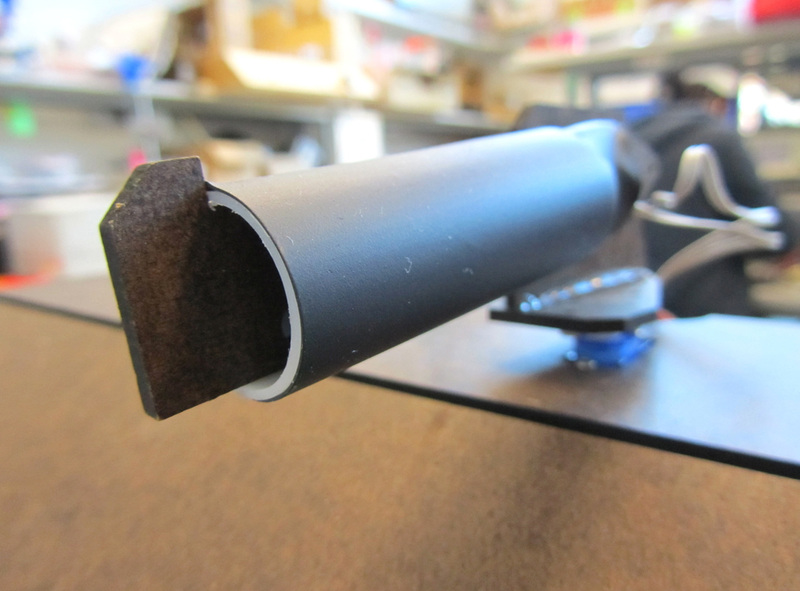 The barrel of the laser gun holds a red laser for visual aid in aiming and an IR LED to trigger the correct board square when the user fires. 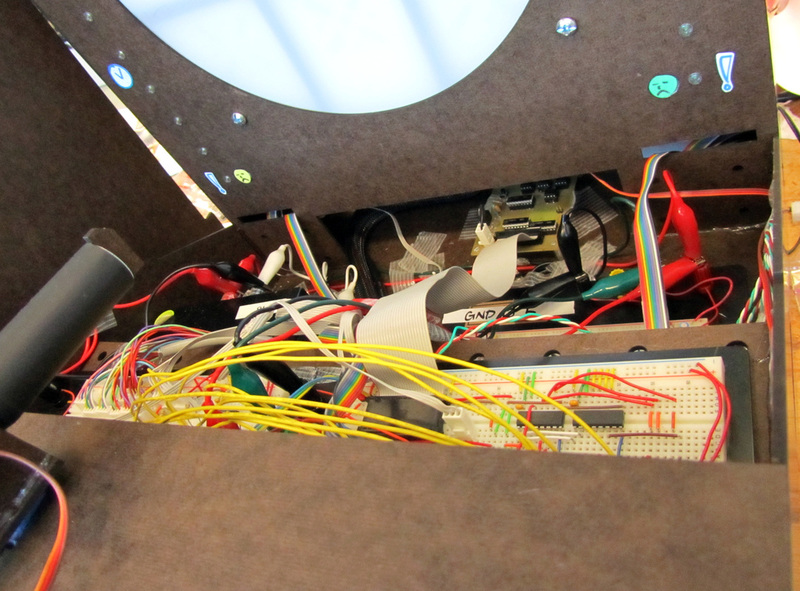 Electronics: A lot of wiring went into this project for the controllers, laser gun, and board LEDs to function properly. 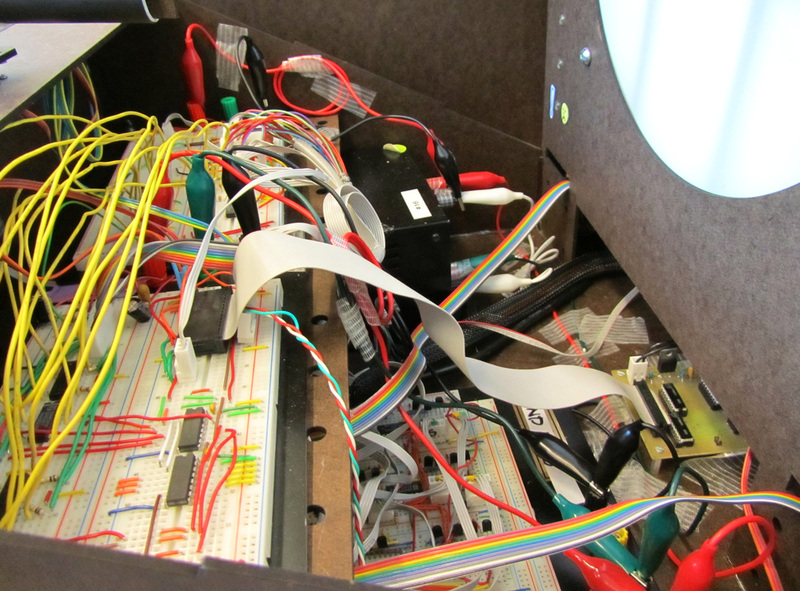 The circuits are detailed in the electronics section of the website. 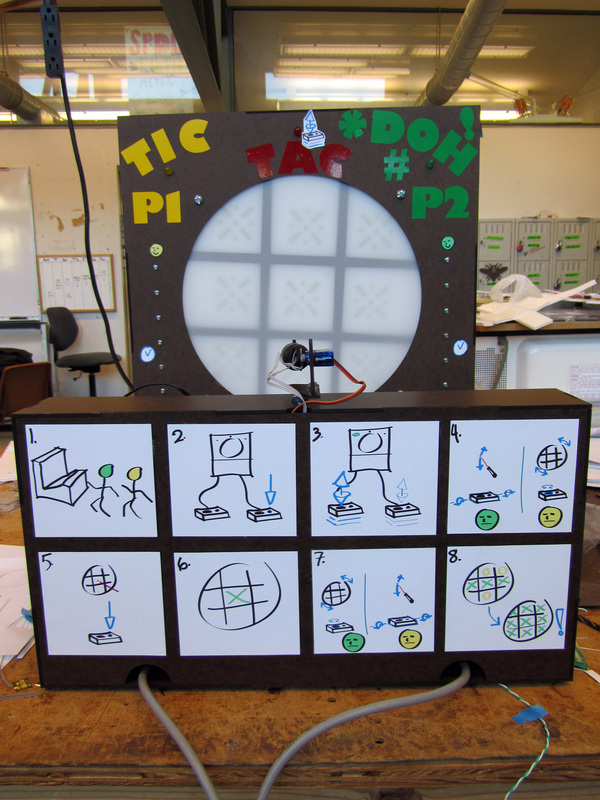 Tic-Tac-Toe Backboard: A servo attached to the backboard rotates the entire board to make aiming more challenging. 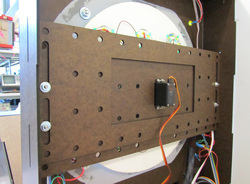 The backboard diameter is 12”, and is constructed from foam-core. 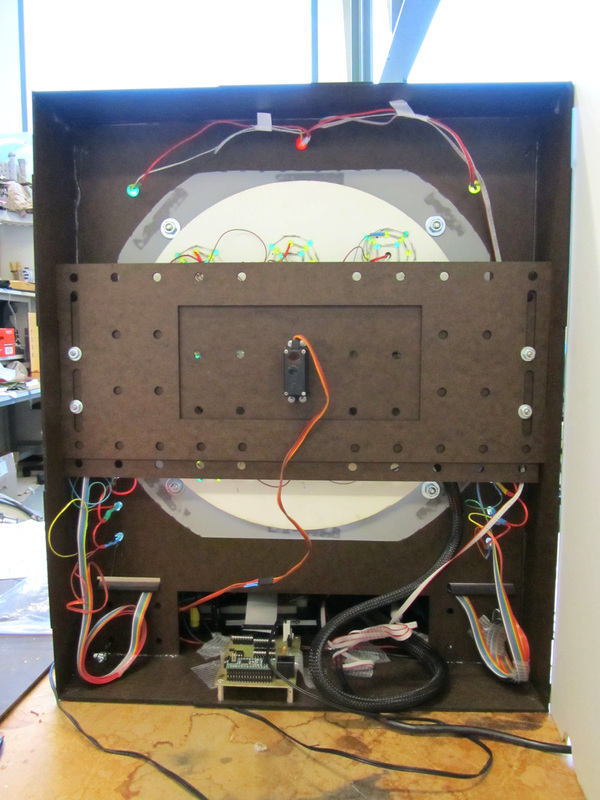 All the wires are routed together and bundled with braided sleeving to avoid tangling as the servo rotates the board through its 120 degrees of motion. 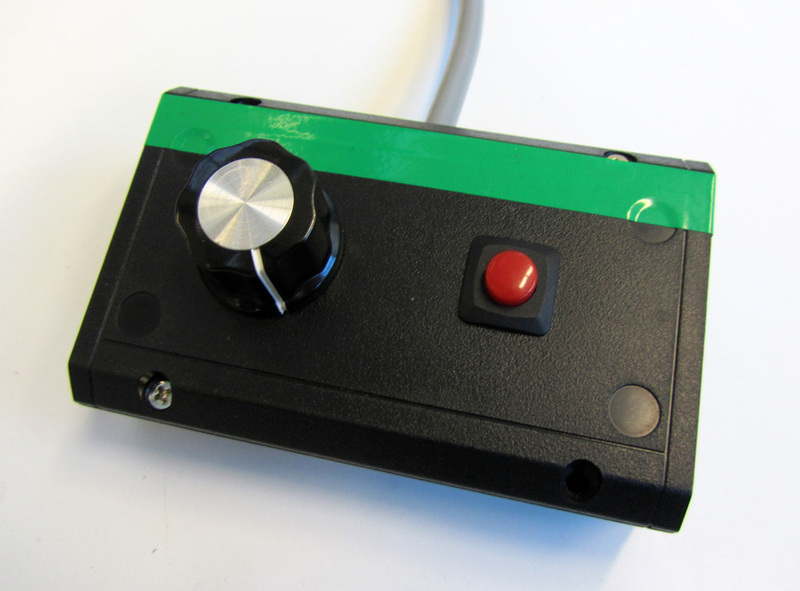 Controller (covered): The external components of each controller consist of just one potentiometer and one momentary SPST switch button. 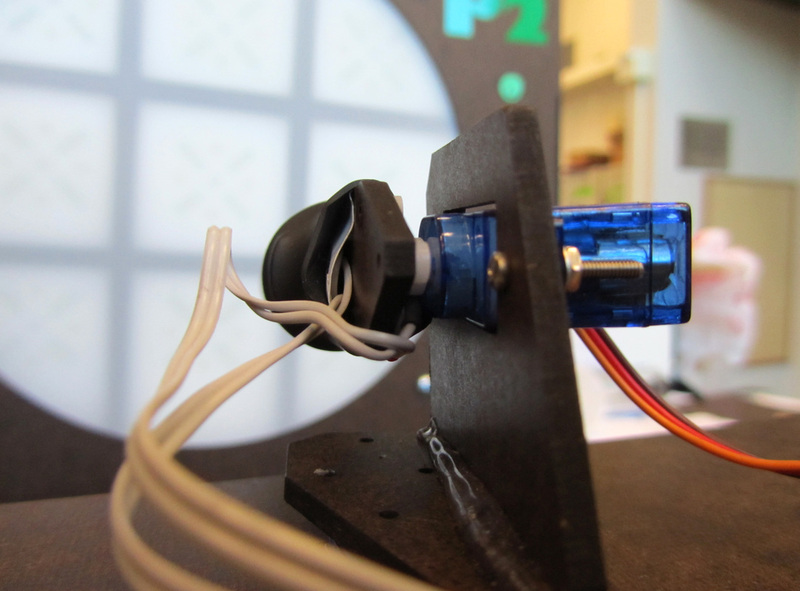 The aiming player presses the button to shoot at a target. 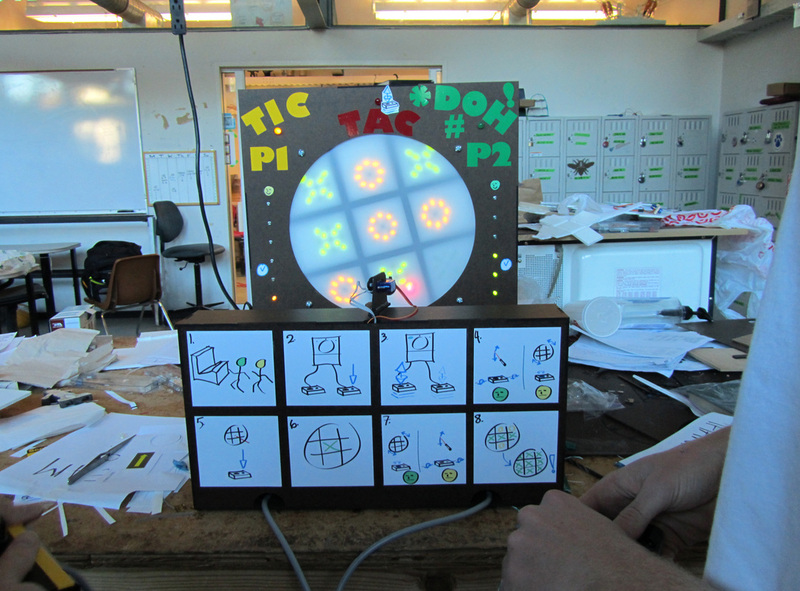 Rotating the potentiometer allows the defending player to move the backboard to try to throw off the opponent as he or she aims the laser gun. 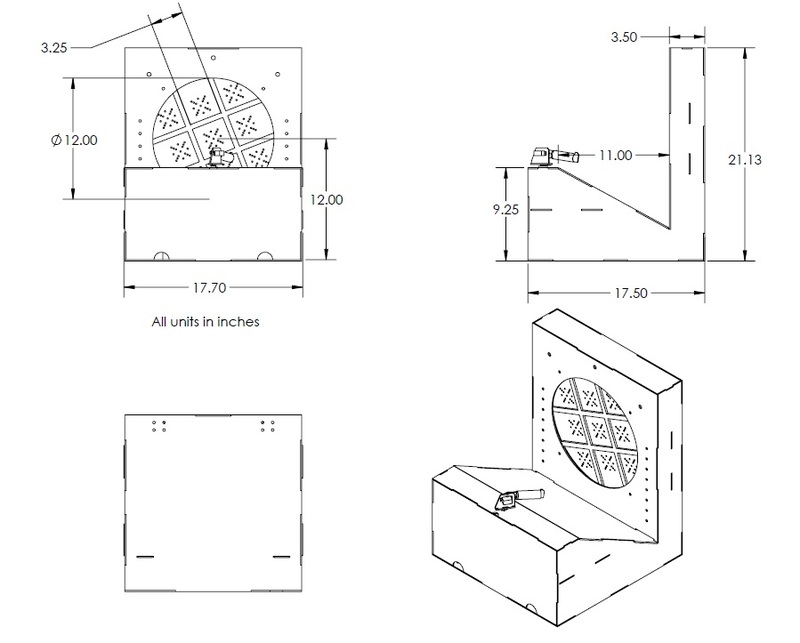 These components are housed in a plastic project box with custom holes for mounting. 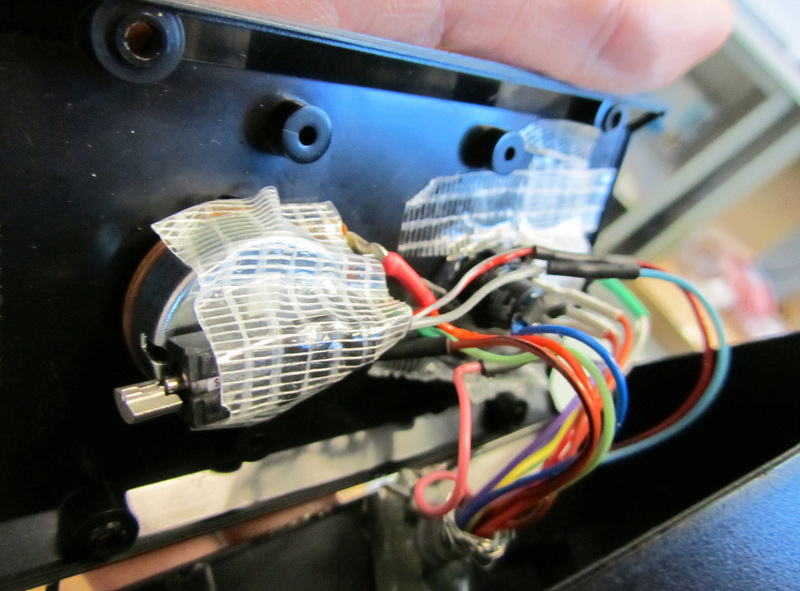 Cover Removed: The internal components of the controllers also include a three-axis accelerometer and an eccentric mass motor. 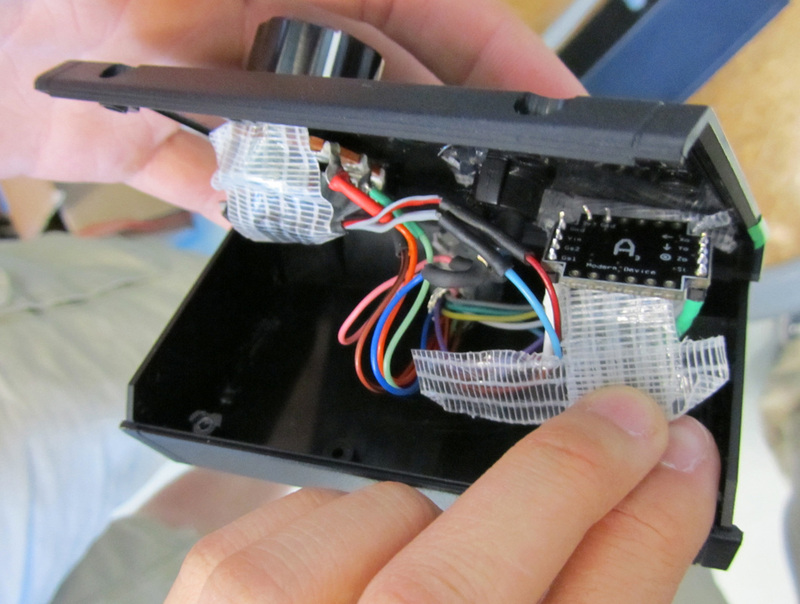 The x and y axes of the accelerometer are used as tilt sensors so that the player aiming the laser gun can adjust the aim horizontally and/or vertically by simply tilting the controller in the corresponding direction. The z axis measures the number of times the users each shake their controllers during the “coin toss” shake-off portion of the game to determine who shoots first. The eccentric mass motor provides one second of vibrotactile feedback at the end of the coin toss and after any target is hit. 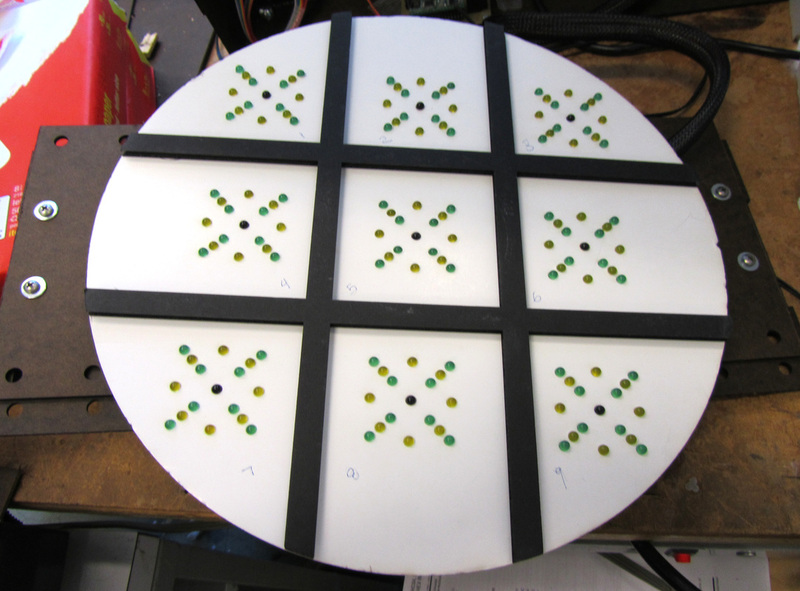 LEDs: Eight yellow LEDs allow a circle to light up in each of the nine squares, while eight green LEDs in each square form an X. The X’s and O’s indicate which player has hit which square during gameplay. 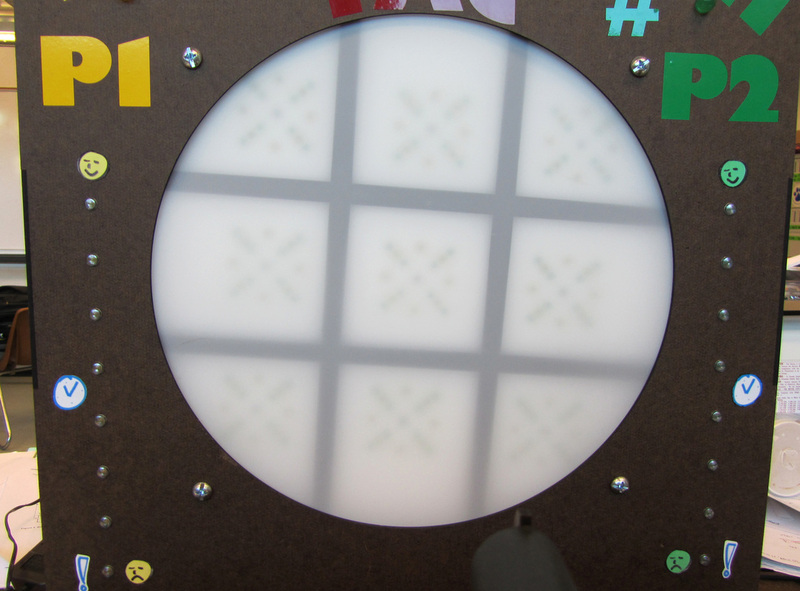 On each side of the backboard, eight more LEDs in each color keep track of each players remaining time to aim for that game session, timed in two second increments. 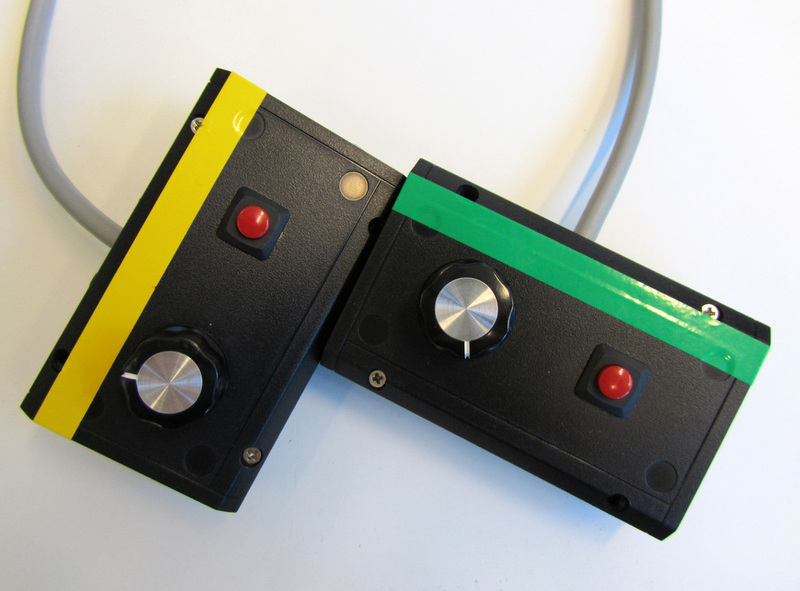 The large red, yellow, and green LEDs at the top indicate the game state, either coin toss, player 1 aiming, or player 2 aiming, respectively. Phototransistors in the center of each square sense the IR light from the IR LED in the gun.